When you grow up in North Carolina, there are certain likes/cravings/obsessions that are hard to remove from the system. For example, drinking a cold cheap beer on a scalding summer afternoon, NCAA basketball (or so I've heard), and fried chicken. My father had his own special fried chicken recipe that I think is still the best in the world. I’ll have to try it again as it’s been a long time since I attempted to pull it off. This recipe is an adaption of his version. He would marinate chicken drumsticks in a marinade used for Yan Shui Ya—full of Sichuan peppercorns and ginger—and after marinating over night he would use the traditional Chinese method of steaming and then deep frying for his fried chicken. It's a way to get a flavourful and tender bird, that's also very crispy. My recipe developed out of a funkier way to fry a chicken wing. I saw a french chef on youtube lollipop a chicken wing, similar to Mauritian chicken cutlets, and decided to give it a try using my dad’s marinade with a wet tempura-like batter. Using a wet batter is cleaner than using a dry flour batter as the flour mixture doesn't "contaminate" the oil as much and you can easily skim out the batter that separates from the chicken in the oil. 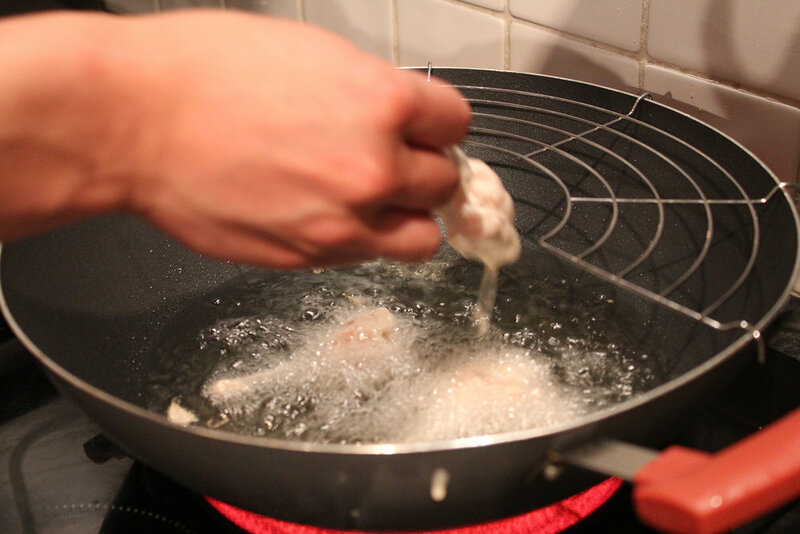 Chicken wings, being small, don’t require the first step of steaming. The main trick is getting the lollipop right. I've added detailed photos and a video. Cut Chicken wings at the elbow join. Take the wingette and snap the tip back while applying pressure at the top with your thumb. The two bones from the wingette should protrude out. Pull out the smaller bone. You might have to jiggle it a bit to loosen it. Cut off the tip and discard or save for a broth. Take the end of the meat that’s been cut and pull it over to form a lollipop. Marinate with salt, ginger, garlic, spring onions, Sichuan pepper corns, Shaoxing wine, and sugar for at least 2.5 hours in the fridge. 30 minutes before frying remove wings from the fridge to come to room temperature. Mix the flour, corn starch, 1 egg and cold water in a bowl. Mix thoroughly and add 4 ice cubes. The mixture should not be too thick, but not too thin. Kind of like a smoothie or a milk shake that's been sitting out at room temperature for 10 minutes. Remove the spices from the wings and drop into the batter to coat evenly. Heat oil in the wok to medium-high heat. You should have enough vegetable oil so that after pouring into the wok, there should be about 1 inch of oil. Fry in batches of around 4–6 at a time. Flip over every 2 minutes. Fry until golden brown, which should be around 8 minutes. Drain on a wire rack, not on paper towels. Draining deep fried food on paper towels makes the food soggy as the oils start to coagulate with the fried crispy exterior. Cut Chicken wings at the elbow joint. Take the wingette and snap the tip back while applying pressure at the top with your thumb. The two bones from the wingette should protrude out. Pull out the smaller bone. You might have to jiggle it a bit to loosen it. Cut the tip off and discard or keep for a broth. Then take the end of the meat that’s been cut and pull it over to form a lollipop. Next take the drumette and cut down the end of the bone. Flatten the meat out and pull over to form a lollipop. Mix the flour, corn starch, 1 egg and cold water in a bowl. Mix thoroughly and add 4 ice cubes. The mixture should not be too thick, but not too thin. 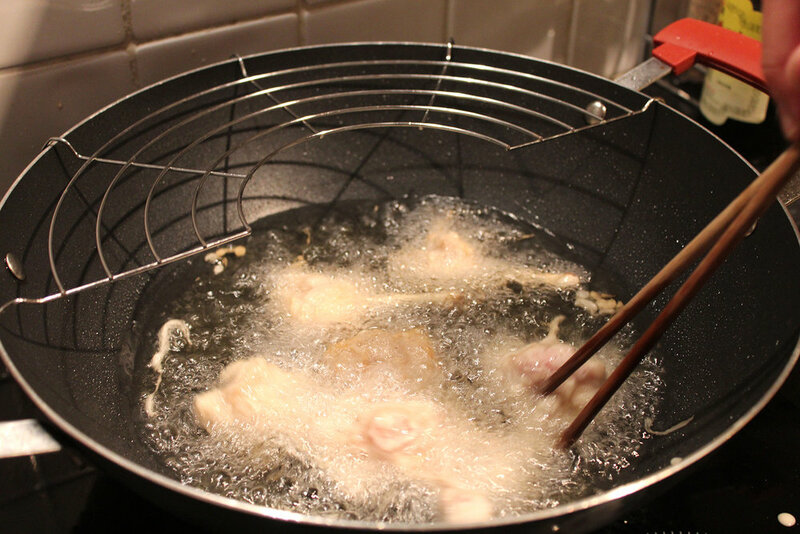 Heat oil in the wok to medium-high heat and fry. Fry in batches of around 4–6 at a time. Flip over every 2 minutes. Fry until golden brown, which should be around 8 minutes. Drain on a wire rack, not on paper towels.